The Blanco 4 meter telescope equiped with the Dark Energy Camera, located at Cerro-Tololo Inter-American Observatory in Chile, under the spectacular Milky Way. 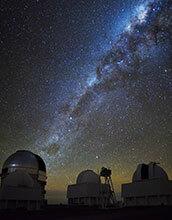 The Dark Energy Survey (DES), currently in progress at the National Science Foundation's (NSF) Cerro Tololo Inter-American Observatory (CTIO), is supported in part by NSF. The survey's goal is to find out why the expansion of the universe is speeding up, instead of slowing down due to gravity, and to probe the mystery of dark energy, the force believed to be causing that acceleration.